The responses to the Adoption at the Movies contest showed quite a lot of variety. People touched by adoption have a range of experiences, and all voices are valuable. Today, Julie shares about a film that stirs mixed feelings in her. She loves Annie, but is also troubled by it. Julie’s words are challenging, and remind me that grief and loss are real in adoption, and that adoption is not an “automatic” fix for anyone – that in fact, some adoptive families end up being non-nurturing. As a social worker, this highlights to me the importance of educating prospective adoptive parents on being sensitive to the power of loss and the importance of openness, and it also highlights the value of a thorough home-study process. At the same time, I know that many adoptions create environments in which children are nurtured. What do you take from Julie’s heartfelt words? 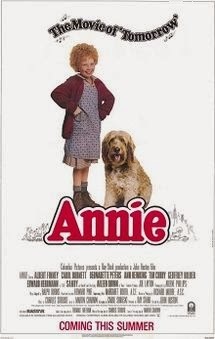 Although it's an old movie, Annie is the movie that had the biggest impact on me as a child and as an adoptee. As an infant adopted in the baby scoop era (as I now know it was called) I never knew where I lived before I came to be with my adoptive parents at two months of age. So, of course I wondered if I had lived in an orphanage like Annie and her friends, and whether a woman like Miss Hannigan took care of me. And I knew all those Annie songs...all of them by heart. I especially remember the one called Maybe and dreamed about my biological parents, who they were and if my mother had made me a closet of clothes like it said in the song. My adoptive parents were very wealthy, much like Daddy Warbucks. I used to wish that the movie ended differently with Annie's parents coming forward and Daddy Warbucks returning to the work he loved. I was always so sad that Annie's "real" parents had died in that fire. Even then I did not see Daddy Warbucks as a real father. Annie was a very troubling movie for me as a child (can't you tell!) and at the same time something in me loved it. Now I just think it would be so interesting if someone remade it with an alternate ending, with Annie's real parents coming back and Daddy Warbucks fighting them for custody of Annie! I think that would make for a great story (oh, that has already happened with the Copabiancos and Veronica Brown). I guess this is really not my "favorite" adoption-related movie, but it is the one I remember the most. I think this was pretty well said. I grew up loving musical theater and largely being introduced through films like Annie and The Sound of Music, where kids are (at best) neglected by their legal gaurdians and their care falls into the hands of others, until everyone gets the morality lesson at the end and it ends "happily ever after" one way or another. While most of my memories are good, I find that I actually avoid this tale as an adult. Seeing this review actually made me question why. In the end, I don't really have a good answer. While I was never mistreated (well, ever parent makes mistakes, but never were any of those mistakes even remotely close to abuse) as a foster/adopted kid, this movie is still challenging for me. I think it's because it perpetuates the stereotype that 'wealthy' people adopt or that kids are best off with financially wealthy parents. Yes, kids need adults that can and will provide for their needs, but at the same time, that doesn't necessarily require a large degree of wealth. Hi J! I love what you said - that kids do need parents that can (and more importantly will) provide for their need s- but that this doesn't require a large degree of wealth. Working in foster care adoption, I've seen adoptive parents come from a wide range of incomes - and there isn't a correlation between income and love.